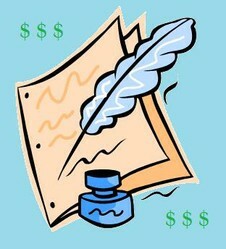 There are some websites that let you publish your poetry and creative writing and earn from it. These sites are Pen Strokes and Triond. There are many websites online that allow you to share your poetry, lyrics, and creative writing with them and hence with the world but most of those sites don't reward you for it. Out of those sites there a few that actually let your earn from the poetry, lyrics, and creative writing you publish with them. These sites are Pen Strokes and Triond. Gather, which let people earn from their writing no longer exists. Pen Strokes is a sub-site of Daily Two Cents, which is one of the sites owned by Harlow-McGaw Media. On Pen Strokes you can publish your poetry, lyrics, short stories and other creative writing, and you get the chance to earn some money from that. How? Well, all you have to do is drive unique traffic to whatever you publish on Pen Strokes and you will earn. The earnings are pay-per-view and you get $2 for every 1,000 views you get. So, the more views you can get for your published posts there the more you will earn. Since Pen Strokes is a pay-per-view site you do not need an AdSense account to be able to earn. All you need is traffic. And the more of it you can get the better. Once you reach $5 in earnings you will get paid. Payments are sent via PayPal so you need to create a PayPal account if you don't already have one. If you already have one, there is one less thing for you to worry about. Now go write some great poetry or other creative pieces, share them with the world via Pen Strokes and see how much traffic, and in turn earnings, you can get. Content submitted to Triond gets placed on different websites depending on what type of content you publish. When you submit your poetry, lyrics, short stories and other creative writing on Triond it will get published on the AuthSpot website (authspot.com). Whatever you submit to Triond doesn't get published automatically. It must first get approved. If everything is okay the writing gets published and you can start sharing it online with your potential readers. Your earnings on Triond come from advertising revenue. When users click on ads that are displayed on your pages that you have published, or sometimes when ads are simply displayed there (known as ad impressions) you will earn revenue. How much you earn per click or per impressions varies. The earnings can be in cent amounts or in dollar amounts. Revenue sharing is split 50/50. You get 50% of the revenue that comes from your published pages. The other 50% goes to Triond. Once you have earned as little as 50 cents you can get paid. There are different advertising networks that Triond uses. One of them is Google. To be able to earn with Google you need to have a valid Google AdSense account. When you link your AdSense account with Triond Google ads will be shown on your pages that you publish and you will earn revenue when users clicks on any of those ads. Once you have accumulated $100 worth of ad revenue Google AdSense will pay you your earnings. Be sure never to click on ads on your pages as Google doesn't allow that. If you do it, especially on a regular basis you won't get paid your earnings and your Google AdSense account will be suspended. If you have a Google AdSense account and you use it on other websites then you don't have to earn $100 in Triond or AuthSpot earnings to get paid by Google. You simply need to earn a combined total of $100 regardless of which site it comes from. If you don't have an AdSense account you will have to sign up for one but before you can do it you have to publish a good amount of good quality content otherwise you will automatically be rejected. Gather was a website that allowed you to publish your poetry, lyrics, short stories and other creative writing, share it with the world and earn. People were able to read what you wrote, comment on it, and share it on social media sites.There was no limit to how many things you could publish and if I am not mistaken what you published there could be published elsewhere online. The way you made money on Gather was by first earning GatherPoints. These were virtual points that were earned by being active on the site and by getting activity on your published posts. The more writing you published, the more traffic and interaction it got, and the more active you were on the site by participating in groups and on others' posts the more GatherPoints you earned. Once you had earned enough GatherPoints you were able to redeem them for various gift cards like Amazon and Starbucks or better yet for actual money, which was sent to your PayPal account. The minimum number of GatherPoints you needed to earn to be able to redeem them for cash or gift cards was 625, which was equivalent to $10. This was not bad at all. I liked the idea of Gather and the fact that writers were able to earn not just by sharing their writing but by simply being active on the site... It didn't seem that easy for me to get enough GatherPoints to be able to redeem but I did redeem a few times, which was still an accomplishment for me, even though it wasn't much at all. I am not sure exactly what happened to Gather or why they decided to shut down but that's what seems to happen these days. Plenty of writing sites that pay writers end up closing their doors.